SPECS: Dia. 5 1/2" x H 3 1/2" 1 Qt. Red - Description: This product has a wooden handle that stays cool even under the highest of temperatures. It has a small spout on the lip for easy pouring. The milk pan does not come with a lid. This product is available in four colors: blue, green, red and yellow. 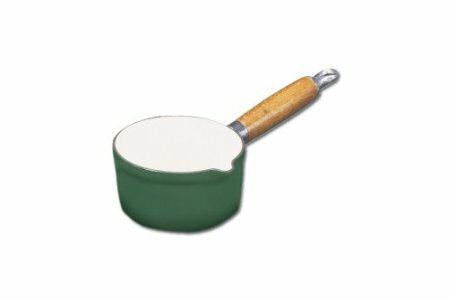 Click the button below to add the Chasseur Enamel Cast Iron Sauce Pan With A Beautiful Wooden Handle Green to your wish list.